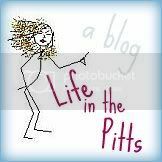 Life in the Pitts: I wish this didn't happen so often. I used to and still do have vivid dreams of my grandma. Makes me really sad to wake up from these dreams. i'm so sorry that you have to experience a broken heart like that. I believe that the worst pain came in the days and weeks following my Mom's unexpected passing. For a few brief moments, I would forget and the pain of remembering would take my breath away. Four years later, I now cherish each and every dream moment spent with her. It's almost like having her back again. I'm sorry for your loss, and I understand your pain. I don't understand, and I cannot begin to imagine, but I just looked at your lil profile picture and I imagined myself hugging you even though I barely know you. I've had that happen to me quite a few times too. I'm so sorry. That can be so hard. I am so sorry. It sounds like you have a lot of support and I'll send my virtual hugs too!!! Ohh...I'm so sorry for you. Reliving that heartbreak is horrible. But. You will be with her again one day! I lost my father suddenly this last April 7th. I will never forget the day, the phone call, I couldnt stand up, my breath left me. To this day, every sunday, I think, oh I need to call my dad.....just today, I saw a pie pan, he had brought over, and it made me cry. But I know that every day gets easier to remember him and smile instead of crying. I dont know how long it has been for you, but I know that although I miss him so much it aches, I can now smile with memories of him, before I cry..praying for you today. I'm sorry to hear about your loss. I lost my mom a couple of months ago. I'm still dreaming about her. Usually, I say, "Mom you're dead. Then she says, "Oh, you're right." and fades away. Last night I forgot to do that, so I had the pleasure of going grocery shopping with her. No, I don't know where that came from. I lost my father when I was in the first grade, and here I am, a grown woman with teenage sons, and still I dream of finally finding my father, and scolding him when I find him, saying, "do you know how long we've been looking for you???"